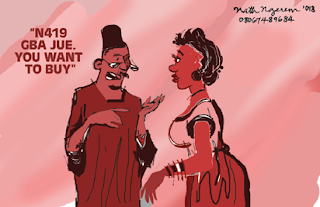 Afrisonet: Why desperate women fall for oldest trick all the time! Why desperate women fall for oldest trick all the time! ~Vanguard Nigeria. Tuesday, July 10, 2018.
in skimpy clothes and expensive hair extensions, ready to lure away husbands without a second thought to the families of such men. But sometimes, the truth is usually more complicated. As a result, many women who find themselves the 'other woman' are caught in situations they never bargained for. Take the case of Mylah for instance. "I wasn't looking for a relationship when I met Jacob,'she told me, a bit sad. 'I'd just split up from my husband of 11 years-and was busy looking after the three children of the marriage. "Jacob was a friend's elder brother and we met at my friend's 40th birthday party. He told me he's been estranged from his wife for months and was waiting for his divorce to be finalized. According to him, his wife hadn't really adapted to the fact that wives were supposed to behave differently from when they were abroad,'and when they finally relocated to Nigeria. I didn't ask 'him for details and our relationship quickly took up from there. He gave me his mobile number as well as his home's and visited every spare minute he got. Gradually, we became very fond of each other and he sometimes slept over at mine. "He lived alone and when he suggested I moved in with him, I agreed. The children were in the boarding house-and having them for the holidays wouldn't be a problem. As soon as Jacob's divorce was through, he promised we would get married-I was very happy. The fact that he was technically married didn't bother me and he openly let me know when he was popping over to his old house to see his two children. I was after all, a mother and knew the importance of both parents to children. "I later discovered that life with Jacob wasn't always smooth-sailing. When we had rows, he would storm off for hours. Then last year, the friend I met him through arranged for us to come with her family to the Benin Republic to see a relative and have a holiday in the process. I jumped at the chance and Jacob was quite willing to go. The morning we were to go, he picked up a quarrel and stormed off again. I was furious when he didn't turn up hours later, fearing he might be in an accident. I called my friend to cancel the trip, telling her why. She calmly told me Jacob was already outside their house in the car with his wife! I was in shock. I'd believed him 100 per cent when he said they'd split. I'd had no reason not to. We were living together for heaven's sake! I asked my friend to take the phone to him, but he refused to talk to me. "My friend later called me from their hotel room to tell me she didn't believe there was any divorce. That Jacob and his wife were still very much together. That as far as she knew, they'd only had a temporary separation because they'd been having violent arguments, but that Jacob had still been going round to his family home to try to sort things out. I thought of all those times when he'd dropped in on his wife, supposedly to see the kids, and felt really ill. I'd been the other woman all along without even realizing it-'I would never have encouraged the relationship if I knew I was going to be a bit on the side. "I felt as if someone close to me had died. When he eventually turned up though, he was full of apologies. He said he was so mad after our row and went to his wife, asking her on the spur of the moment if she wanted to come away with him-and she said yes! I looked really skeptical at him and his story, but he swore his marriage had really been over and my friend told me all she said because she didn't know better. And like a fool I believed him! I warned him I'd never be a mistress and he swore I wasn't-and that the divorce would soon be through and we would get married. "After that he became the charming and loving man I'd fallen for. But I soon realized he was up to his old tricks. Only instead of cheating on his wife with me, he was cheating on me with a colleague in his office. I saw him flirting away with her at a party and I just knew. In the end, I packed my things and went back to my flat-thank goodness I hadn't let it go. Within days of my leaving, this colleague of his had moved in! I feel really sad about what I'd just gone through. If I'd thought for a moment that Jacob's marriage wasn't completely over. I'd never have got involved with him. He made me feel so cheap. It just shows if he's going to lie to his wife, he'll lie to his lover too." According to a former 'reluctant mistress,' Many more men have affairs than ever leave their wives, and if they're going to, it is generally early on in the relationship. Even for the mistress who has a 'happy ending,' there's often a price to be paid. If she gets the man and marries him then has a rocky patch later on, quite often, she'll find herself thinking: "Is he having an affair? He did it to her, he could do it to me,' it's far better to wait for the split to happen and then start a relationship. My advice is to try to steer clear of the role of the 'other woman'-it is self-destructive and damages families. The way he treats his wife is quite often how you can expect to be treated in future."